Alex Chatt lunges for the ball. The sophomore fell in her doubles match against Alabama, but won in singles. The rematch against Alabama did not go as Northwestern had hoped. Unfortunately for the Wildcats (1-5), three singles matches went to a deciding third set, and all three three-set matches were lost. Senior Alicia Barnett, freshman Lee Or and junior Jillian Rooney each went the distance in the team’s 5-2 loss to the Crimson Tide on Sunday. For NU, this has been the story of the season so far. The Cats have come close to winning most of their contests, but sometimes just cannot put their opponents away. In the past, coach Claire Pollard has said NU has to fight the psychological barrier of losing the doubles point. Against the No. 17 Crimson Tide, though, the Cats lost the doubles point but still had a chance at victory in singles play. 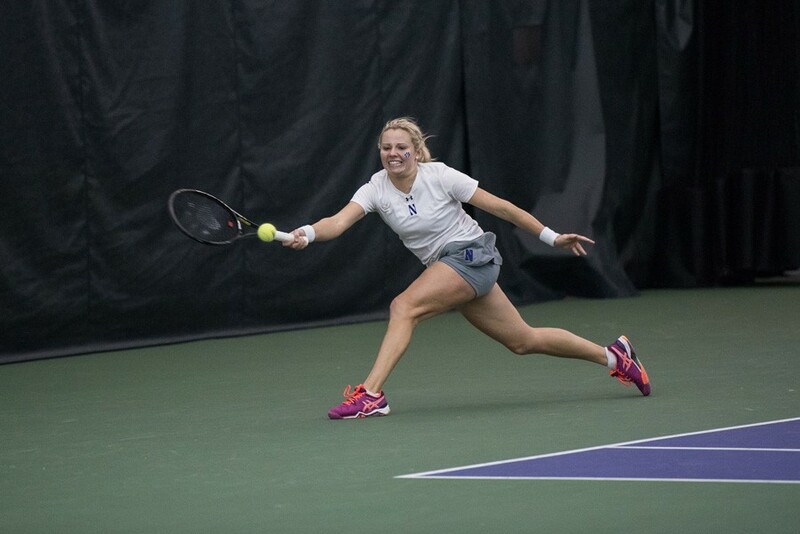 This was NU’s second match of the season against Alabama. Last time out, the Cats wiped the floor with the Crimson Tide, but neither team had much practice before that match. Five weeks later, Alabama showed the improvements it made on the court. NU will have to get back on track quickly though as Big Ten play starts Friday against conference rival Illinois. Traditionally, at this point in the season, the Cats have racked up a few wins and have been ranked well within the top-25. However, this season has proven especially tough for NU. This season has been tough on Barnett, the lone senior, as she has seen so many good seasons in her three previous years, she said. From this point forward, the Cats can only build from these. Most of the losses have not been blowouts, but close matches. NU has played some highly ranked teams and has come close to winning, but at the end of the day, it’s the win-loss record that people will see.